Simple, right? Yeah, not so much. Along with those ingredients, Wild Planet also proudly features a large “NON GMO Project VERIFIED” logo above that list – and on all their packaging. This is where it all gets a bit fishy. Why? 1) Because there are no genetically modified fish available for sale to consumers, and 2) Salt is a mineral and therefore has no genes to modify. 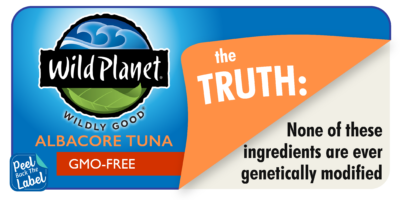 With no genetically modified alternatives, this label only serves to confuse consumers into buying Wild Planet’s canned tuna by touting a distinction without a difference. By jumping on the labeling bandwagon, Wild Planet has done quite a disservice to its customers by flouting science and catering to fear mongering instead. We hope the company takes a cue from others, like Clover Leaf Seafoods, and removes this deceptive label from its products. In the meantime, don’t let these misleading companies get their hooks into you! Tell Wild Planet you aren’t buying this misleading claim by Tweeting, posting on Facebook or emailing them today.